Wildly popular with high schools, community theaters, and professional groups, Seussical brings together the characters of almost 20 Dr. Seuss books into one zany universe. Seussical appeals to a wide age group, including not only kids but their parents, who grew up reading Seuss (or having it read to them). With a cast of thirty-five, this show requires brightly painted sets and a plethora of costumes. 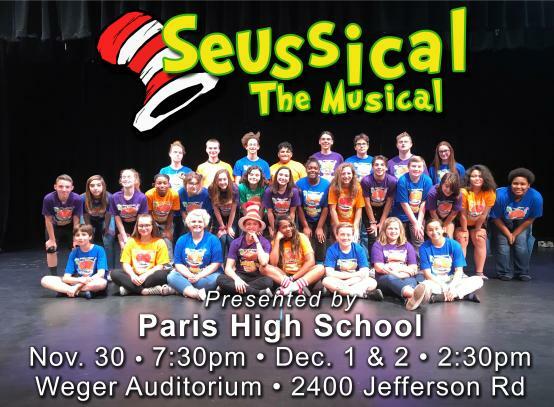 Show times are Friday, November, 30 at 7:30 pm with additional 2:30 pm showings on Dec. 1 and Dec. 2 in the Weger Auditorium at Paris Junior High School. Two school performances will be held on Thursday and Friday.